Love how that note is technically 100% truthful. Yes. It’s probably nothing for her to be concerned about. She’s not about to get hurt or hurt anyone with it. He didn’t say it didn’t have *potential* to be concerning. Only that it’s nothing to be concerned about. As long as it’s just glowy eyes, he’s right. Most of my English skills are self taught so I don’t understand what this is saying. She means that Selkie doesn’t “talks likes this” when she is reading aloud. She reads them normally since she is directly referring to the words. It’s not a speach impediment in Slekie’s case though. Per Pohl, theSarnothi language uses plurals for reasons other than their literally being more of something, and Crash Course immersion English learners thus get the “talks likes this problems” from habit. So basically Selkie talks the way she does out of habit due to English being her second language. It’s basically an accent. Good catch Mina. I never even paid attention to that. So Selkie does actively know how to speak proper English, despite the snakes talks ons hers speakings. Dunno if the snake talk is intentional or not though on her end. As commented elsewhere, it’s *basically* a grammatical accent. Proper speech therapy could work around it, but it’d take time and effort. It’s because her native language (Sarnothi) uses pluralization differently, and no one has taken the time to help her remove that habit from her speech. In a very real sense, it’s nothing more than a bad habit, and time and effort could fix it — but language being what it is, and having been left alone for as long as it has, fixing this bad habit is going to be a *lot* of work, a *lot* of time and a *lot* of effort. I don’t think she does actively know. It’s been forgotten in the modern era, but literacy isn’t a singular skill; speaking literacy, writing literacy, and reading literacy are three separate skills that used to be taught separately. 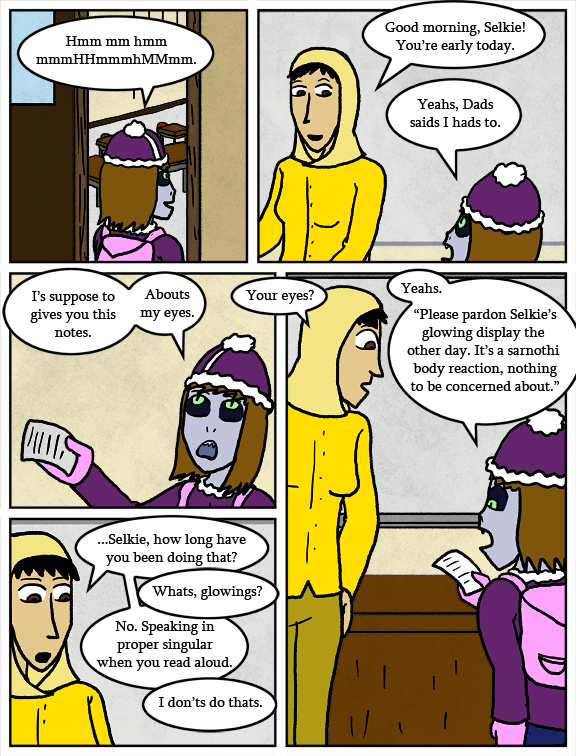 What Selkie is demonstrating is that her reading literacy and speaking literacy are not on the same level. I love how Mina accepts the contents of the note and hones in on the speech. That is very teacher, and awesome. Oh, you clever, clever boy, Dave 😉 I see where this is headed. Not to sound ungrateful, but this comic’s panels do not read in the correct order. The 4th and 5th panel should be swapped. Just a heads up. I read it the intended way cause of the “your eyes” bubbe, yeah. Yeah, the panel structure is a big no-no. If you want it to go small-big-small in future, consider making the whole bottom section of the page be one big panel, with a smaller panel in the top left corner and a smaller panel in the bottom right corner. Also, if you haven’t yet checked out some Chris Hart books from the library, or some How to Draw Manga series, then by all means look into them. And I forget if we’ve discussed Scott McCloud’s “Understanding Comics” and “Making Comics” but as a webcomic creator you should probably own both of those and have them on your shelf next to your drawing station. And maybe read through them once a month or once every other month, just to see which new things you pick up as your skill grows. For the longest time I just thought it was an accent and she was ending words with a slur, like saying ‘yesh’ instead of yes. I thought it was cute, and was a bit disappointed when I found I was wrong. I read the last two panels out of order. I don’t know why people are complaining about the flow of the comic panels on this page. I read left to right, so when I got to the 3rd panel, I naturally just continued to the right of the page. Not to mention you actually tied the two panels together with that one word bubble. I’m not sure what would cause anyone to break the flow of the panels by going in a completely different direction than what is pretty much standard, but I wouldn’t worry about it Dave. I wonder how many people here actually read American Comics on a regular basis, since they read in the same direction and have done the same thing you did on this page. It’s not new, it shouldn’t be confusing. What’s that tune Selkie’s humming? Ah! yes, that fits. Thanks, chaps. Reminds me of a lot of the southerners I’ve dealt with. They clearly know what correct English sounds like, because if you phonetically parrot back what they say, they don’t understand you, but always understand correct pronunciation. It’s pretty weird, but it would suggest the dysfunction is somewhere just before the speaking point, after the ‘thought ‘point.